These Homemade Snickers are like the real thing but 10x better, seriously. I have made them for the last 3 years as part of my Christmas baking (although there is no baking involved in these). Every time someone bites into them their eyes immediately go big, and I hear “ O.M.G! These are amazing-like the real thing but….gourmet” The problem is that in the past they usually take a couple hours to make as you have to wait for each layer to cook and set before you can start the next, last year I wised up and realized I could force the layers to set a little faster while I moved on to the next one through the magic of my freezer. Line an 11×17 dish with parchment paper so that it overlaps the ends. Place chocolate chips and peanut butter for your first layer in a microwave safe dish, heat in 30 second cycles, stirring between each until smooth and creamy. Pour mixture into paper lined pan and spread until smooth and even, place pan in freezer. Mix powdered sugar, marshmallow fluff, and peanut butter in a seperate bowl until well combined- I found it easier to just use my hands to get it all incorporated- grease your hands lightly and knead it like you would bread (or playdough). Remove first layer from freezer ( If it is not hardened let it sit longer and chill in freezer) spread second on top using a combination of your hands and rubber spatula. Place back in freezer. Place caramels and heavy whipping cream in a pan and heat over medium stirring frequently until melted and smooth, remove from heat, stir in peanuts and vanilla. 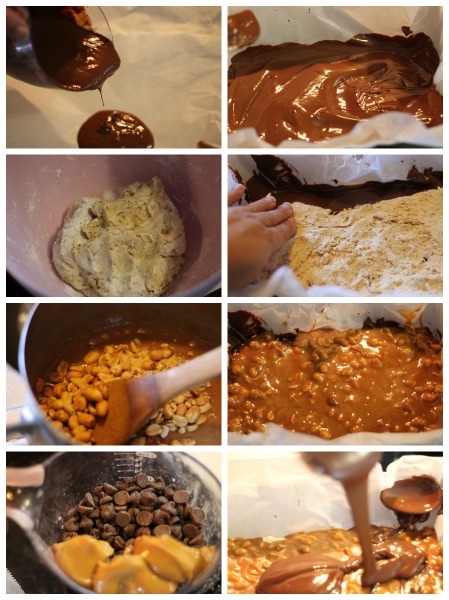 Remove pan from freezer and pour caramel and peanuts over nougat layer-place back in freezer. 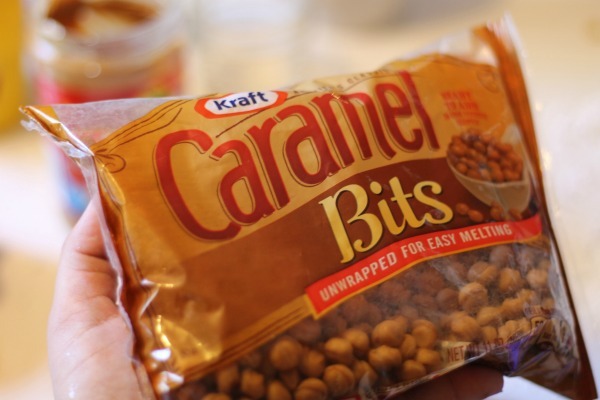 This year I discovered something that made it even easier, instead of spending 30 minutes unwrapping each individual little caramel to melt like I used to do I found this amazing little surprise- Caramel bits, unwrapped and small so they melt quicker-genius! Melt your fourth and final layer-chocolate chips and peanut butter using the same bowl you used for your first, less dishes right? Melt by heating in microwave in small increments and stirring frequently. Pour and spread all over the top and… yes return to freezer. That’s it, you’re done, just let your final layer set and you are ready to bite into the deliciousness that is a homemade Snicker. um, yes, please– I LOVE Snickers– can’t wait to try it!! Snickers is one of my weaknesses. This bar version looks awesome! These Snickers look deliciously AMAZING! I can see why everyone falls in love with them after the first bite! 🙂 I’ve gotta try out your recipe asap! Pinned! We will just love your homemade Snicker Bars. Thanks so much for sharing with Full Plate Thursday and hope you have a great week. 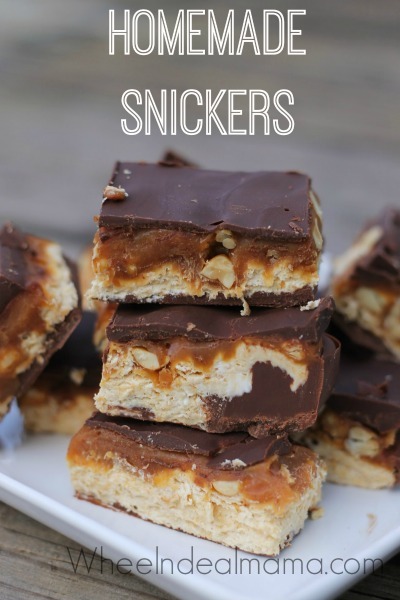 snicker bars looks delicious thanks for sharing with Hearth and soul blog hop. pinning.